French and American Watercolors, Drawings, etc. Odilon Redon with 40 works was, as in Gallery J, the focal point of Gallery K. Although his works ranged from 1865 to 1912, almost all of these were lithographs and etchings executed during the 1880s and 90s. Three portraits reflect his collaboration with the Nabis artists Maurice Denis, Pierre Bonnard, and Edouard Vuillard. Examples of his extensive book illustration appear in his work from Songes and the Temptation of St. Anthony. His mythological studies, Pegasus Captive and Serpent Crowned with a Halo are representative of the shadowy, ethereal prisons Redon was preemininent in conveying. Complementing Redon's work was that of Edward Munch, whom Kuhn secured for the show after the Sonderbund exhibition. Munch's woodcuts and lithographs revealed the potential of these two graphic mediums. His emotionally charged portrayal of ecstasy can be seen in Madonna, while Kiss and Vampire illustrate two diametrically opposed visions of desire. 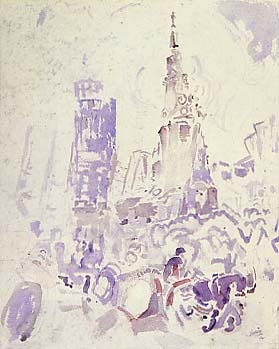 John Marin's watercolor series of Manhattan buildings received more attention than the work of any other American artist at the Armory Show. The recently completed Woolworth Building (the lights were first lit on April 24, 1913), which reigned as the world's tallest building from 1913 to 1930, was Marin's focus for the series. Marin's work, some of the most concentrated studies at the show, appeared at Stieglitz's gallery from January 20th to February 15th just before the Armory exhibition. They were discussed at length in The Forum by W. D. MacColl as well as in the New York American by Alfred Stieglitz. His Woolworth series was taken as a futurist rendition of New York, and the impact of his formal treatment of the New York skyscraper can be seen in a number of Armory Show parodies.